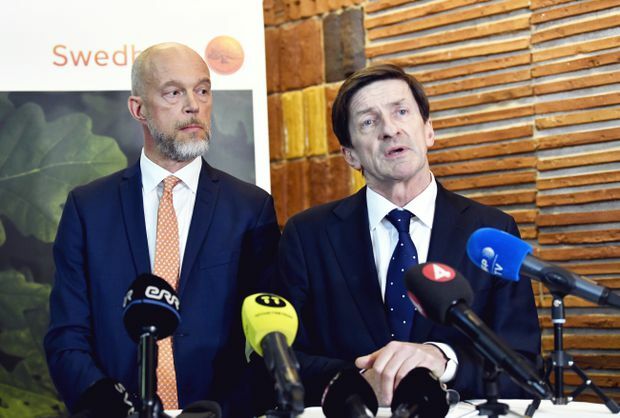 Swedbank chairman Lars Idermark, right, takes part in a news conference in Stockholm on March 28, 2019. Swedbank chairman Lars Idermark has quit only a week after the lender’s chief executive was ousted over her handling of a money-laundering scandal, saying the controversy threatened to distract from his role as head of forestry group Sodra. The bank, Sweden’s biggest mortgage lender, had fired its CEO Birgitte Bonnesen last week only an hour before a heated annual shareholder meeting marked by disgruntled investors rounding on her handling of the money-laundering allegations. Allegations against Swedbank, largely reported by Swedish TV, have linked it to a scandal at Danske Bank, which faces potential lawsuits, fines and sanctions after admitting last year that €200-billion ($300-billion) of suspicious payments had flowed through its Estonian branch between 2007 and 2015. “Following recent strong debate about Swedbank and questions about the bank’s control of suspicious money laundering in the Baltics, I have concluded that the media attention is not compatible with my CEO role at Sodra,” Mr. Idermark said in a statement on Friday. “It’s a welcomed and expected decision, but it shouldn’t have taken so long; it would have been better if he resigned before the AGM,” Swedish Shareholders’ Association chief Joacim Olsson told Reuters. Mr. Olsson called on the bank to put all cards on the table, including internal investigations into its dealings in the Baltics. Both Ms. Bonnesen and Mr. Idermark had been under fire for the bank’s communications and how they have handled the allegations, which have sparked a four-way investigation by regulatory authorities in Sweden, Estonia, Latvia and Lithuania. Swedbank shares, meanwhile, have lost about a third of their value.